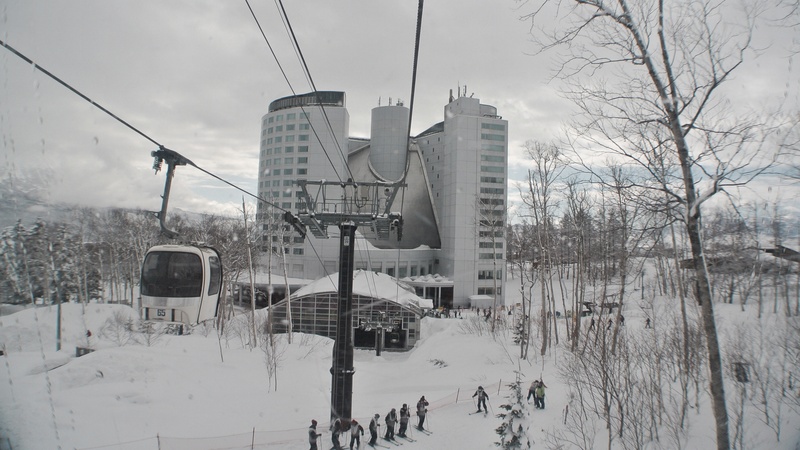 Rusutsu Resort is the largest resort of its kind in Hokkaido located in the village of Rusutsu. With a total of 37 courses, it expands through 3 mountains: Mount Isola, East Mountain and West Mountain. In particular, a superb view of Lake Toya and Mt. Usu spreads out from Mt. Isola which you can ski down while seeing the façade of Mt. Yotei. To be able to see this incredible view as you go down the mountain is a true pleasure that can only be experienced in Hokkaido. From the continuous high-quality moguls for the advanced skiers and high-difficulty courses with slopes of 35 degrees to gentle slopes so that beginners can slide down without worry, every possible course is supplied. And at the kid-friendly Crayon Shin-chan Plaza, children can enjoy winter activities such as sledding and tubing. This is a ski resort where adults and children alike can refresh themselves in the middle of Mother Nature. Even if you can’t ski or snowboard, there are plenty of other activities where you can take advantage of the snow while enjoying the grand nature of Rusutsu. Whether it’s dogsledding across the snow fields, riding snowmobiles that even novices can tackle, horseback riding or going on exploration nature tours through the woods while wearing snowshoes, there is also a lot of fun to be had that can only be experienced in snowy Hokkaido. Rusutsu Resort is not a place that is just enjoyed during the winter only. It’s an all-year resort which not only has that ski area but also an amusement park with rides like roller coasters. And during the times without snow, you can use the gondola to get to Yotei Panorama Terrace, the viewpoint on Hokkaido’s prominent Mt. Yotei. Rusutsu has become a resort which has granted the wishes for the entire family with facilities such as an onsen, an indoor pool and a restaurant/shopping area. Hokkaido’s Niseko is a hit for winter sports due to the superior powder snow which falls during winter. In recent years, along with Japanese tourists, the resort has also attracted an increasing number of overseas tourists who want to enjoy the skiing and snowboarding. Niseko Annupuri International Ski Area is a resort located on the active volcano of Annupuri, and with its characteristic gentle slopes, it is especially recommended for those novices at winter sports and people who want to take that relaxing slide down in the midst of nature. Along with that great feeling of skiing down in the middle of nature, you can also appreciate the calm landscape of Annupuri while on the lift. There are also plenty of areas for the children to enjoy things such as sledding and other snow activities so this is the perfect place for families. During its winter operation while the snow is on the ground, there are a lot of other events held as well. The lift areas are lit up with candles during night operations, and in the New Year, there are activities outside of skiing to get the excitement up such as a countdown fireworks performance. Also around the Annupuri area, there is Niseko Onsen along with many other onsen hotels. How about warming up in a hot spring to rid yourself of those chills at the ski resort? Even if winter operations come to an end, the Annupuri resort is also great for fun that can only be had in the summer. The 1000m plateau observation point at Annupuri provides a grand view. The observation point can be easily reached by gondola so you can enjoy that walk in the sky. There are also many outdoor activities such as nature tours and trekking so the resort is great for full enjoyment during summer with its grand scenery of Hokkaido. If you are interested to know more and save your time during your trip to 北海道, You can send a message to our local guides to get a customized itinerary and quotation for an unforgettable experience.